Editor’s Note: Due to the fact I had to go to a wedding, and it was my girlfriend’s mother’s birthday, my beloved Seahawks lost which got me in a funk for a while, and it was the Emmys, this isn’t up until Monday. No harm, no foul. Green is known as the creature color. But it should be more known as the nature color. Sure, in nature there are creatures, but there is more to Green then just pounding heads by attacking. But the idea of if there’s one color that loves creatures, it’s Green. It does get the biggest creatures for the casting cost with almost no drawback, and for a little while, seems to be getting better creatures over all. Because it only makes sense that alot of what Green can do is through it’s main identity (Blue loves instants, so when people think instants, they think Blue *Paid for the people who support Blue). It has artifact kill, it has draw, it creates mana, it gains others abilities as well; Green wants it’s creatures to “do the talking,” and sometimes that means to smash face. Most of what Green does, is with its creatures, or tied to them as much as possible. But that doesn’t mean the only thing a Green mages cares about is creatures. If it is unnatural, then Green hates it. That’s why Green has stepped up in it’s artifact/enchantment hating; it sees both of these as unnatural (unless it applies to mana or creatures) and must be destroyed. Sure, there can be some magic in the Multiverse, but mostly, it just has to be left alone. Like some hard-bent environmentalist with the ability to actually make some change, Green wants to let nature run its course and we all live in it. Sure, there can be small changes to creatures along the way, but if only to improve their way of life, not to harm it. But that doesn’t mean that Green doesn’t understand death and decay. Green merely sees death as a part of the “circle of life” and sometimes be worked around. That’s what recycling is all about, isn’t it? Life, as Green sees it, is running with the pack, survival of the fittest, becoming one with nature. And it’s the “one with nature” bit that makes Green so unique with it’s land searching capabilities. “How is land growth not natural?” asks the Green as they play more lands than you. Lands are the essence that we need to be in this life, and Green isn’t going to stop that from happening. Allowing nature to grow and prosper, that’s how Green lives. Artifacts – They’re unnatural, so they must be destroyed. Very rarely are artifacts found in favor of Green (even the rare “Green” artifact from Mirrodin dealt with Creatures and mana), so they must be destroyed. Much like Bender in that Futurama episode where he makes himself wooden, Nature and Technology can’t co-exist. Creatures – Obviously, Green loves creatures. While there were very few Green direct damage spells aimed at creatures in the past, it was seen as nature causing the damage. Now, the only way Green gets rid of creatures is to attack it with other creatures. Let the biggest and the best win. Enchantments – Also unnatural. They too must be destroyed, if they don’t benefit creatures or mana. Abundance can sneak by since technically it looks for land, so it can be considered Green. But if they don’t benefit, then no “Magic” is allowed. Lands – Since lands are a part of nature, one might think that they are safe. Green does has some land destruction, but not as much as Red. Land comes and goes in nature, so it’s only right that Green has the ability to make it both come and go. Black – Even though they see Death as a natural part of life, Black likes the dark stuff as well. Killing, discard, destruction, all of these things an wholly unnatural. Black uses everything to its own selfish means, not giving anything back. And that, is not friendly at all with Green. Blue – Last week I said Blue love the metaphysical. Green loves the physical and anything unnatural. See how they hate each other? Red – They both have a common bond in their “Instinct/Emotion” ties (which will be explained when I touch on Red). While some of the destruction is not to Green’s liking, they each have a common goal of trying to make things the way the should be, though in different ways. White – The sense of community (or the pack) is what these two colors have in common. They both support helping other creatures out, though with different reasons. They both like life gain (Something Green sees as natural, while White sees it as protection) and their hatred of anything they don’t like, i.e. artifacts and enchantments. Creature – Troll Ascetic for showing that Green’s creatures can be beat sticks and in touch with nature. The shroud ability is its natural protection from unnatural abilities that opponents might play. Instant – Natrualize. How much more hatred for unnatural things can you get when you can destroy both? 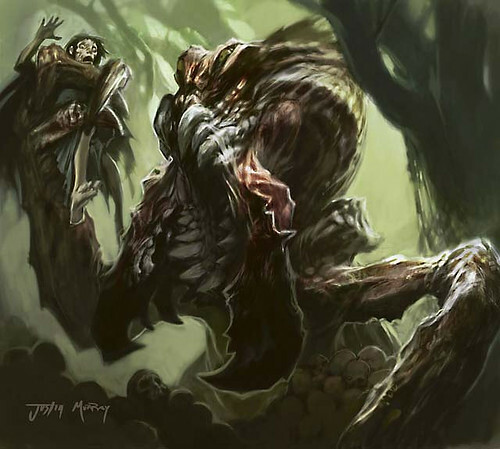 Sorcery – Biorythmm is a great example of showing everyone to be tied into your creatures. If you don’t rely on nature, it can come back to kill you. Of course, with all of these topics, I can’t go into great detail about why certain colors do certain things. These only appear as guideline instead of rules. Tomorrow, I’ll talk with MaRo again about what he said today. Did he actually read my article since he hit on everything I talked about? Don’t believe me, read MaRo’s here, then read mine.